The H3 SoC support has matured since its introduction in kernel 4.2. Most of the board functionality for boards such as Orange Pi Plus 2E are available with current mainline kernels. Some features (hw accelerated crypto, hw spinlocks, and thermal) are still being worked on. For a more comprehensive list of supported features, see the status matrix for mainline kernels. In addition, legacy 3.4 kernels are available in various work-in-progress git branches. Use the orangepi_plus2e_defconfig (supported since v2016.09) build target. The U-Boot repository and toolchain is described in the Mainline U-Boot howto. The H3 boards can boot from SD cards, eMMC, NAND or SPI NOR flash (if available), and via FEL using the OTG USB port. In U-Boot, loading the kernel is also supported from USB or ethernet (netboot). HDMI support in U-Boot is still WIP. Configure this kernel using sun8i_h3_defconfig, the rest is explained in the kernel compilation guide. Use the .fex file for generating script.bin. Use the xunlong_orange_pi_plus_2e.fex or Armbian's preliminary fex file for the Plus 2E containing performance/thermal fixes for dvfs_table and cooler_table. A newer H3 BSP variant appeared with tons of fixes which has been made available by FriendlyARM. A cleaned up fork has been adopted by Armbian project. On top of that Armbian maintains a bunch of 3.4.x patches for H3 devices. The mainline kernel has good support for the H3 SoC. Please refer to the status matrix for a more detailed list of the development process, links to patches and links to kernel fork repositories. Minor drivers that are currently work-in-progress may require a) third party patches (see also arm-linux mailing list) or b) a pre-patched distro (e.g. Armbian). Use the sun8i-h3-orangepi-plus2e.dtb device-tree binary. The Orange Pi Plus 2E has a Raspberry Pi model B+ compatible 40-pin, 0.1" connector with several low-speed interfaces. The FEL button between microphone and UART header triggers FEL mode. The Plus 2E is somehow a hybrid between Orange Pi PC and Orange Pi Plus 2. It shares the USB setup with the PC (not using an internal USB hub and no USB-to-SATA bridge) and exposes all 3 USB hosts ports as well as the USB OTG directly on USB receptacles without the need to share bandwidth. And with the Plus 2 it shares type/amount of DRAM and onboard eMMC storage, Gigabit Ethernet and the board size. Like all larger Orange Pi boards the SY8106A voltage regulator is used allowing fine grained control of the VDD_CPUX core voltage. Regarding software compatiblity all that's needed are slight modifications to the fex file (using USB stuff from PC and Ethernet from Plus/Plus 2) when using legacy kernels. 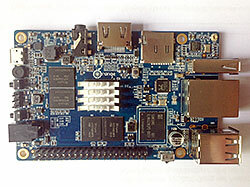 Mainline kernel and U-Boot directly support this board. The board comes with the eMMC already populated with Android. Like on Orange Pi PC Plus and Orange Pi Lite the formerly used 8189ETV WiFi module has been replaced with an onboard 8189FTV solution. The available driver has to be build differently, needs some fixes and shows currently the behaviour that it chooses a different MAC address on every reboot. WARNING: For yet unknown reasons the lima-memtester tool does not work as designed on the Plus 2E (no spinning cube therefore no heavy load so currently it's just a memtester without lima so the results below are worthless and tests have to be repeated when the tool has been fixed). DRAM is clocked at 672 MHz by the hardware vendor. But the reliability still needs to be verified. One of the ways of doing reliability tests may be https://github.com/ssvb/lima-memtester/releases/tag/20151207-orange-pi-pc-fel-test (developed for Orange Pi PC). An adoption of this using fex files suited for Orange Pi Plus 2E is available here (md5sum: ca8b910a5f60bbd11781423e8ade59fd fel-boot-lima-memtester-on-orange-pi-h3-v3.tar.bz2). Use the fel-boot-lima-memtester-on-orange-pi-plus-2e script inside. Since the board features an Android populated eMMC the procedure to run lima-memtester through FEL is as follows: eject SD card, connect OTG cable to your host, press the FEL button, then provide power through barrel plug or GPIO pins, then start the fel-boot-lima-memtester-on-orange-pi-plus-2e on your host. Most probably lima-memtester will continue to run when you cut DC-IN since after the board has been powered on it can also use 5V provided through OTG port. The UART header is between FEL and power button (simplified layout: ..MIC.. [TX][RX][GND] ..DC-IN..). Just attach some leads according to our UART howto. Please note that the board is sold without heatsink. This is just the tester's standard heatsink for all H3 boards now. This page was last modified on 4 December 2018, at 06:20. This page has been accessed 46,342 times.